Unity is diversity is what we are taught since childhood. And this is true also, especially in consideration with India. No matter how different we are from cast and creed, we are one by being Indian. We unhesitant accept other cultures and traditions and most importantly food. Yes, food is one of the biggest things that bind all Indians together and forever. I know you are amazed with the heading of my blog and want to know what is inside. Before that, let me give you brief information of Indian food culture. India is a diverse country on the basis of culture. Obviously when the cultures are different food would be definitely different. India has seen some of the most terrible and gruesome conflicts among its diverse populace, but what actually unites it is its (almost) common culture and tradition. The street food culture that we have is one of the most rich and vibrant one in the world. It won’t be wrong to say that few of these nationally local delicacies have always succeeded in blurring the innumerable boundaries that separate each one of us. Amazed?? ?Yes, apart from our thoughts and feelings, food also plays a major role in binding whole nation together and this is the beauty of my India. 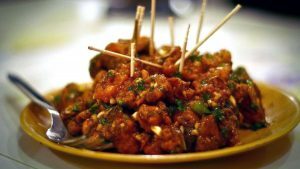 I am today dedicating thing blog of mine on 5 such street foods of India that have totally won the heart of Indians. From Kashmir to Kanyakumari, you can have the delicacy of these street foods. The street food that tops my list is Samosa, after all it has feelings. 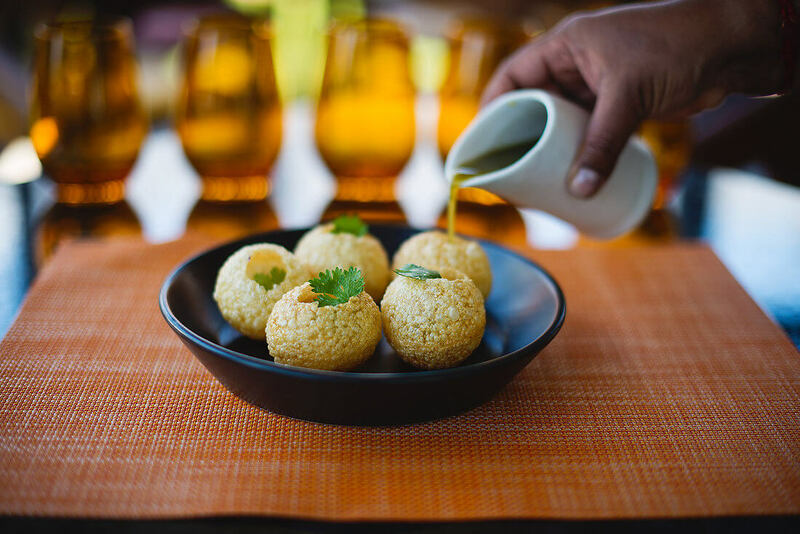 Call it singhaara or whatever you want, this deep fried dish of spicy mashed potatoes wrapped in white flour dough – conical in shape, is the favourite Indian snack. Be it birthday parties or the onset of monsoon or a mundane evening, samosa brings a smile to everyone’s face. 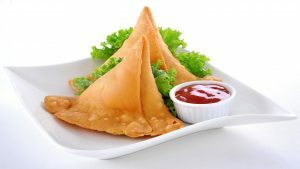 Like the potato filling, samosa also fits perfectly in every occasion. 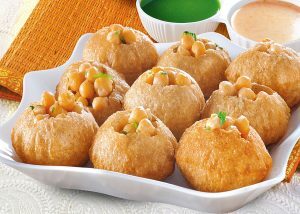 Whether it is Rishta meeting or you are just hanging out with your gang, the fillings of Samosa can create great feelings inside. If I will denote it as the king of street foods in India then definitely no one is going to take me wrong. Golgappe, gupchup, patashe, phuchka, love of my life – this street food also has different names and variations across the nation. On one hand, the UP wala or Bihari gupchup has spicy mashed potatoes filled in puri while serving and dipped in spicy tamarind water. On the other hand, Dilli wale golgappe have mithi chutney in it with an array of different types of puris. Street vendors selling pani puri can be found anywhere, near educational institutes, parks, offices, traffic signals, markets, absolutely anywhere. If not God, at least pani puri is omnipresent. I just remember the Dhara add where a child who was about to run from home gets tempted because mom cooked Jalebi and goes back. You can understand the love for Jalebi in India with this only. India is known for its spices. But the desi sweet dishes are equally ravishing. 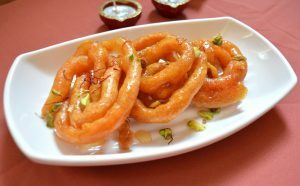 Jalebi is a deep fried intricate piece of art dipped in sugar syrup and made with curd and white flour. Rainy season and hot jalebi is by far the hottest combo to exist in the history of desserts. Biryani is not a food in India, it is emotion. How I can ignore it in my list. I cannot thank the Mughals enough for this! Even though it has numerous variations and varied taste across the nation, it can’t help but be everyone’s sweetheart. Street vendors with gigantic vessels full of this rich dish of rice, spices and chicken/mutton/beef always spread its fragrance through the street. 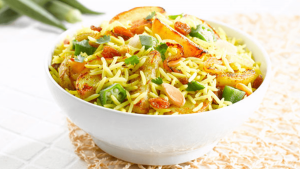 This mouth-watering dish has gained more prominence in the last few years and has become an important part of the popular culture. Last but not the least in my list is the Indianised Chinese food. If you are wondering why I am naming Chinese food like this then this is India my love. We don’t adapt anyone’s thing we just make it ours. Chowmein, Manchuria and rolls and there are much more. There cannot be a single street in India which doesn’t host stalls which sell these delights. They are far from the authentic Chinese food, but who can deny that they are dishes on their own now with a special place in our hearts. If this list wasn’t for street food per se I wouldn’t have dared to not mention chai/coffee. It might be made without milk or sugar, but its warmth feels like home. India is full of surprises and especially the streets of India. No matter wherever and in whichever part of India you are, you would always get drooled feeling the aroma of street foods. We are loaded with numerous choices. Every place has its speciality of street foods. And a big thanks to brand like Chat ka Chaska that brings Indian street food in sophisticated and hygienic manner maintaining the authenticity and taste. Reading this blog I am sure, you are going to grasp your plate of street food.